Ready for use white, or colored, acrylic plaster in paste form. The product is resistant to sunlight and the creation of mold, algae and fungi on its surface. Suitable for use as render/top coat instead of marble based plaster. Indoors it can also be used as a decorative coating. It can be applied to all primed building materials such as plaster, concrete, drywall and cement board, aircrete etc., and on all surfaces, such as walls and ceilings. The product meets the requirements of ETAG 004 for external thermal insulation system for buildings, as render/top coat of the system. Classified as external render and internal plaster based on organic binders, per EN 15824. Colors: White and 44 selected color chart colors. 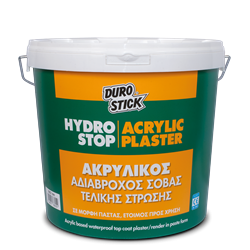 Hydrostop Acrylic Plaster Fine 1.0mm: 1.8-2.0kg/m²/mm. Hydrostop Acrylic Plaster Fine 1.5mm: 2.0-2.3kg/m²/1.5mm.